Are people living longer? Are fewer dying? 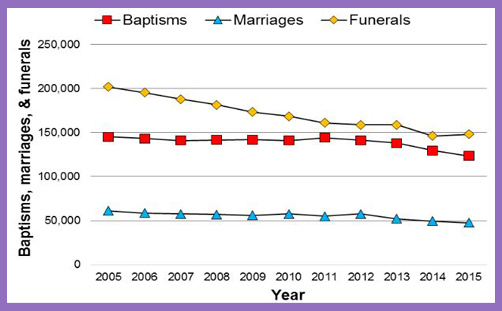 In the decade 2005-2015, the general population increased from 60,210,000 to 64,716,000, so why has the number of Church of England funerals plummeted by almost 30 per cent over the same period? Is it because of increased religious pluralism? The free market in faith diversity? Or because there is more unbelief? Does it stand to reason that if church attendance has declined 14 per cent over a decade, the Anglican manner of dispatching the dead to the happy hunting ground will tumble at twice the rate? Why should that be, when it is mainly the elderly who are snuffing it? You’d think they’d want a standard BCP affair – ‘..man that is born of woman.. ashes to ashes, dust to dust..’ etc,. etc., and a couple of well-known hymns, of course. The Lord’s my shepherd… or don’t their children and grand children know these hymns? The Church of England’s Statistics for Mission 2015 paint a curious picture. Yes, the decline in attendance continues, but CofE funerals have been hit particularly hard, seemingly to the benefit of civil celebrants. Is this at the recommendation of funeral directors? Do they suggest that church funerals are only for ‘religious’ people? Is it because the bereaved now tend to prefer balloons and cuddly toys to ‘In Loving Memory’ wreaths and po-faced vicars? Is it because the local vicar doesn’t want to bury non-believers? Why would a grieving family want to hear that their loved one might be languishing for all eternity in hell? What CofE vicar would preach that? What pastor of any church anywhere would not seek to grieve and weep with those who grieve and weep, living their faith in a feeling community? Do secular celebrants empathise better than Anglican clergy? Is it that vicars are cold, aloof, austere and don’t return phone calls, while civil celebrants are all a bit like Bruce Forsyth or Mary Berry? The Church of England is there for everyone. When you lose a loved one, the church pledges to be with you every step of the way, “giving support before, during and after the service, for as long as it’s needed”. That’s quite a good deal for £178. Are civil celebrants cheaper? Do they serve tea and scones? Are their services more bespoke? Are they with you every step of the way, or just on the day? What do humanists offer but the promise of compost? What does it say about the Church of England’s mission that at the precise moment when people’s thoughts turn most toward eternal life and the hope of heaven, participation is falling at a catastrophic rate? Aren’t funerals a bit like Christmas? Isn’t it an optimal time to share the love, compassion and mercy of Christ? Isn’t that more comforting than a pink balloon and Tinky-Winky Teletubby perched on top of a coffin? As church attendance continues to decline, so participation in funerals is sure to decline. We can blame the rigidity of the institution or the indifference of the clergy, but the real reason the flock is departing is theological. Man that is born of a woman still hath a short time to live, but people don’t quite get that ‘resurrection’ bunkum anymore. How can God do that with ashes? How does He resurrect grandma if she’s been compressed and super-heated into a diamond ring? What about Purgatory or praying for the dead? What happens to grandad if he wasn’t a Christian? How is he forgiven and sanctified? Is there a second chance? How can a baby believe in Jesus? What did a five-year-old do to deserve to die of leukaemia? Why do any innocent children suffer and die at all? Civil celebrants never have to answer these questions. They listen intently, advise compassionately, organise and orate very professionally, but vicars are expected to give pastoral answers that provide hope; to heal hearts and bind the wounds of inconsolable loss. Perhaps people prefer not to hear a theology of the departed anymore: spiritual truth can’t beat Tinky-Winky in the repose of the soul.